The ship did its best to throw us off last night, quite unnecessarily, as this morning our cruise was over. Visually, it was more of a whimper than a roar, if you see what I mean, as we were moored at a pier in a small container port which, disconcertingly, entirely lacked the name Maersk emblazoned anywhere. Instead, it was Matson on nearly every container. It was like an alternate reality. The crew made up for the uninspiring surroundings by a cheerful line-up on the pier, and we each collected 16 hugs or handshakes as we worked our way along to the bus waiting to take us to the airport. There were some tears – not mine, obviously – and promises to meet again, and invitations to visit, neither of which are likely to happen. I’ve done this before. I know how it works. But it was a feel-good moment, the last of many we'd had on the Safari Explorer, and we were all genuinely happy that we had done the cruise. Thank you, UnCruise Adventures! On, on. The bus took us on a good road across flat volcanic flow country, the rocks on each side either shattered or still wrinkled as if they had only just cooled (though that eruption took place in 1801). Tawny grasses were colonising it in parts, gold against the black, and white waves were breaking at the edge of the sea which was turquoise and deep blue. The two biggest volcanoes, Mauna Loa and Mauna Kea, had their heads in the clouds. Cyclists had their heads down against the wind, and we passed an unexpected Beware Donkeys road sign. At the airport we all finally parted company, and we claimed our indulgent hire car, a Ford Mustang convertible – white, not red, we broke the mould – to drive back up the road again to our hotel, the Fairmont Orchid. We passed several resorts on the way, all with neat basalt walls, trimmed bougainvillea hedges, coconut palms and a spread of attractive buildings, and the Fairmont is one of the best. It’s open, airy, beautifully landscaped around swimming pools and a big pond with waterfalls and huge goldfish; it’s attractively decorated for Christmas, the staff are solicitous without being obsequious, and our room is large and comfortable with a view over the manicured golf course and the sea. We set out again to explore, driving south past the town and suburbs of Kona and along a narrow winding side-road where the person driving (ahem, not me) got yelled at by a couple of locals to “Slow the f--- down!” Our top was down, of course, so we felt the full force of their anger – they keep that quiet about convertibles, that you’re literally open to pedestrian abuse. At the Paleaku Peace Botanical Gardens, I breathed deeply of said peace, admired the flowers, learnt about some plants (macadamias are native to Australia, apparently – who knew? ), watched some pretty finches bathing in a rocky fountain, saw a mongoose, skipped the spiritual stuff, and cracked myself, with satisfying ease, a blissfully moist and creamy macadamia in the gift shop. 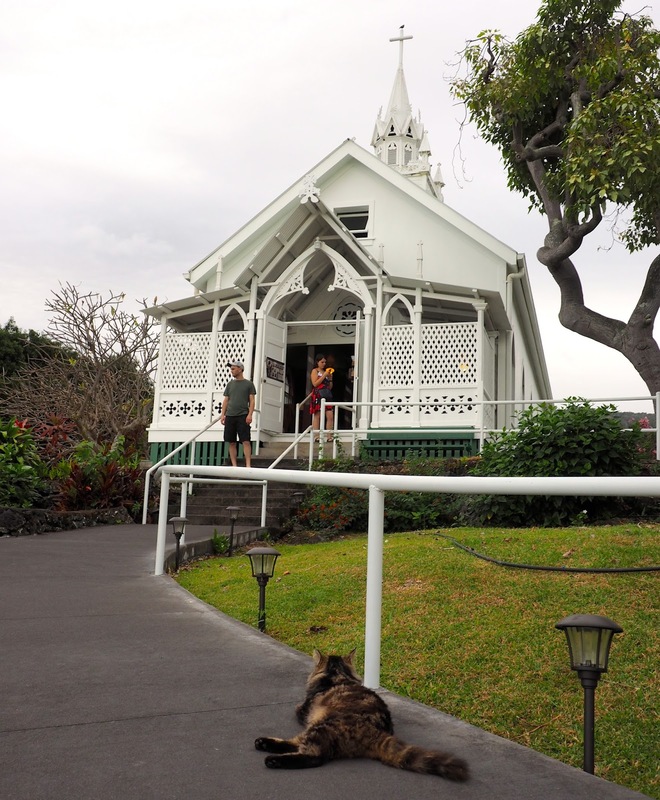 Next stop was the Painted Church, a cute little wooden thing on a hillside overlooking its tropically-planted graveyard. Inside, its original builder-priest had turned his hand to decoration, and painted it from ceiling to floor – from the Stations of the Cross to coconut palms and blue skies. Not what you’d call skilful, but certainly pretty, and unusual. I most enjoyed, though, the two friendly cats sprawled outside, who generously accepted my attentions. The church is still in use, and a few congregation members were gathering for a service, from an ancient man creeping up the path with a walking stick to a bulky bandanna-ed biker who arrived on some roaring beast. Then we drove back – there was a moment of excitement when one of us (not me) managed to switch off the ignition en route while trying to adjust the aircon – and arrived without further incident to watch yet another spectacular sunset silhouetting coconut palms across the bay. Being both cheap and members of the Gold class, we were able to eat what are officially called hors d’oeuvres in the lounge but are really a free option to going to one of the restaurants (though we probably missed something special, not going to Brown’s down in the garden).